Each and every year, Motor Trend Magazine releases the results of its prestigious “Of the Year” awards. With various categories including Car of the Year, Truck of the Year, SUV of the Year, and Person of the Year, Motor Trend provides consumers with insight into which make and model is the best to buy new. Motor Trend has been giving out this time-honored award since 1958, when the publication awarded the Ford Thunderbird as its first ever recipient. Over the past several decades, Motor Trend has solidified itself as an industry authority, and automotive manufacturers around the world covet the very thought of being considered for the magazine’s high-level accolade. The title not only means recognition, but also inspires buyers to flock to Chevy car dealerships just to get their hands on the ever-prestigious Car of the Year. The 2017 Motor Trend ‘Of the Year’ awards were particularly interesting, from the moment that the magazine first released its list of finalists, until the award show took place on November 14. After two days of rigorous testing and intense scrutiny, the judges voted on which one of these contenders most deserved the title of Motor Trend’s 2017 Car of the Year. The result was surprising to some, and obvious to others, and also marked an important milestone for the Car of the Year award. In a giant upset for the San Francisco based electric car manufacturer, the newest Tesla Model S was beat out by the all-electric 2017 Chevy Bolt. The Tesla Model S received a major update for the 2017 model year, which is why the luxury sedan was considered for Motor Trend’s award in the first place. Unfortunately for Tesla, and for people who own a Model S, the premium sedan wasn’t up to par. While the car’s electric range is impressive at 200 miles, the Motor Trend judges were unable to complete the eighth loop of the 27.6-mile track before running out of power. On the other side of the spectrum, and comfortably inside the winner’s circle, sits the 2017 Chevrolet Bolt. The brand new hatchback sedan from Chevy is all-electric, with a range of 238 miles. With a starting MSRP of just $29,995 before government tax incentives of up to $7,500, the Bolt is a savings vortex of futuristic integrity. Motor Trend judge, Chris Theodore, said that the 2017 Chevy Bolt won top prize for a variety of reasons, including the fact that, “It’s twice the car for half the price of a BMW i3.” Judges responsible for evaluating the elite automotive competition also commended Chevrolet for designing and engineering a great small car, regardless of its all-electric powertrain. With a remarkably roomy interior cabin that is praised for its comfort and adaptability, the 2017 Chevy Bolt has managed to fill a void that other electric cars have not. As Tesla has made very clear, the Chevrolet Bolt is not meant to compare with their premium luxury sedan, but consumers who value energy savings over interior opulence, may beg to differ. The 2017 Tesla Model S sedan starts at $66,000 prior to government tax breaks, a number that nearly triples that of the base 2017 Chevy Bolt. The price of these two models alone proves that they aren’t meant to compete with one another, but the final decision on this matter ultimately lies with the consumer. The 2017 Chevy Bolt is slated to arrive at dealerships in the United States before the end of the year, which buyers across the nation are anxiously awaiting. Whether or not the Tesla Model S and the Chevy Bolt are in competition won’t be clear until the first quarterly sales numbers are released, which should be interesting to keep an eye on. 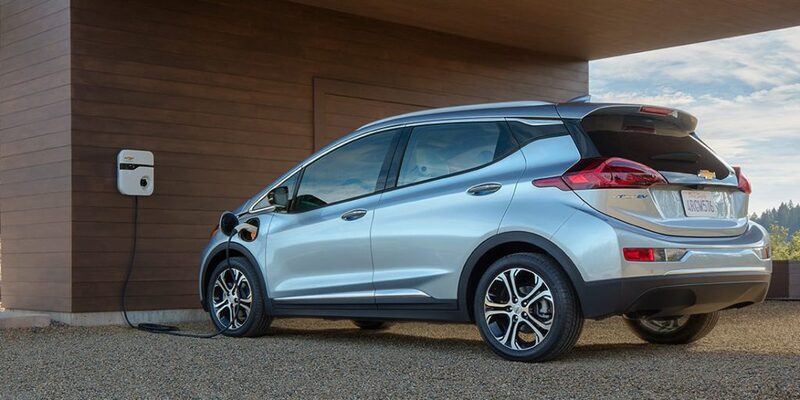 The fact that the 2017 Chevy Bolt earned the coveted title of Motor Trend’s Car of the Year will also likely boost sales throughout the year. With the exception of the overrated 2002 Ford Thunderbird, which took home that year’s Car of the Year award, Motor Trend winners tend to experience a substantial spike in sales after donning their new titles. When it comes down to the Tesla Model S and the Chevy Bolt, these two all-electric cars are more closely aligned than Tesla would like to admit. After all the dust settles from a tight race and stiff competition, the fact that both cars offer a reliable alternative propulsion method remains the same. Rather than pit one against the other, the San Fran-based car manufacturer should come to terms that we are all intent on reaching the same goal – reduce emissions and save planet Earth. Saving money by avoiding the gas pump is just the icing on the all-electric cake. The bowtie brand is still remaining tight-lipped on when the first wave of 2017 Bolt models will arrive at dealerships in the United States, but Chevy insists that it will happen prior to the start of 2017. As we all wait in quietly giddy anticipation, be sure to check back here for updates as soon as they become available. Once the new Bolts arrive at DePaula Chevrolet here in Albany, NY, you can come down and take the Car of the Year for a test drive. We can’t wait to see just how incredible this technology truly is. Be sure to check back often for the latest updates so you don’t miss out on the most anticipated new car model of the decade.